It’s not a sin to have sorrow. If someone ever tells you that Christians should never be sad, don’t believe them because even Jesus was sad at times…and wept. This week Good Morning Girls began reading in the book of Job and in the very first chapter we see that Job’s sorrow was great. In fact, his sorrow was so great that in chapter three we see that he didn’t even want to live anymore. It’s not a sin to have sorrow, but the question is this: where does our sorrow lead us? For some, their sorrow leads them to alcohol and drugs. For others it leads them to depression and they comfort themselves with TV, food, books or gaming. Still others exhaust themselves with work so they don’t feel the pain. That was me. I have two sons who are God’s gift to us, in fact I’d even say they are miracle babies because before I had our first son I had two miscarriages. After our second son, I had two more miscarriages. After the third miscarriage I was so shaken and deeply sad that I couldn’t even talk about it. It was as if just saying the word “miscarriage” would somehow make it real. I didn’t want it to be real. The sorrow in me was so great that I was afraid I’d drown in it. So I comforted myself with work. I would get up early in the morning – around 4:30-5:00 A.M. and throw myself into work. I work at home so it’s already hard to keep proper working hours. I would often work clear through to late at night. I would go to bed around 11:00 P.M., but because of the stress I carried, I wouldn’t sleep well. My children and husband suffered because I often neglected housekeeping….and myself. But it was a trap. While the exhaustion drowned out the pain and sorrow, as soon as I would stop the pain would return. Why? Because I didn’t turn to the only One who could give me joy unspeakable and full of glory! Only in Jesus Christ can we find healing for our souls! 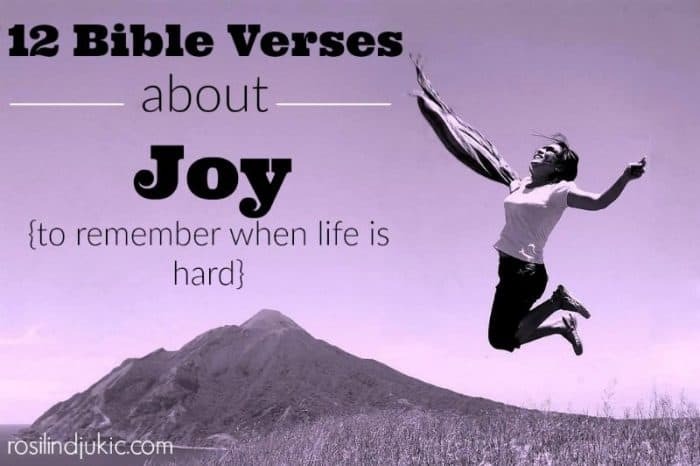 Today I want to share with you 12 Bible verses about joy that we can remind ourselves of in those times when sorrow overwhelms us; so we remember that joy is not dependent upon our circumstances, it is not dependent upon our feelings. True joy is supernatural and comes from God; it is a decision we must make every day – to live joyful lives! 1 Peter 1:8-9 Though now you do not see Him, yet believing, you rejoice with joy inexpressible and full of glory,receiving the end of your faith—the salvation of your souls. Psalm 43:5 Why are you cast down, O my soul? And why are you disquieted within me? Hope in God; for I shall yet praise Him, the help of my countenance and my God. James 1:2-3 My brethren, count it all joy when you fall into various trials, knowing that the testing of your faith produces patience. Psalm 27:6 And now my head shall be lifted up above my enemies all around me; therefore I will offer sacrifices of joy in His tabernacle; I will sing, yes, I will sing praises to the LORD. Isaiah 35:10 And the ransomed of the LORD shall return, and come to Zion with singing, with everlasting joy on their heads. I especially love the verse from Psalm 43 – It’s so good to talk to our souls, to infuse truth into the mess that can live there if we don’t pay attention! This is a wonderfully mindful post! Oh yes! I love that one, too!! Great reminder and great encouraging verses! Thanks for sharing!! Yes – they are so encouraging!! I am so glad you stopped by, and I’m blessed that these promises spoke to your heart. I’m so sorry for the pain you’ve endured. I, too, have experienced the pain of miscarriage. It takes a long time to rise above that. I especially love Heb. 12:2. We need to continually look unto Jesus, the author and finisher of our faith. Sending you my love and prayers. It does take a long time to rise above the pain, but Hebrews 12 (the whole chapter) has been a life line to me. Love these verses! I have lost a son to miscarriage and struggled with depression and anxiety ever since. Joy doesn’t come easy to me. I have to work for it. Thanks for collecting some verses for me to use. I shared this post with my blog FB group. I think a lot of people can benefit from the hope of these verses. I pray that these verses will hold and carry you. I am so sorry for your loss. It is such a hard valley to walk through. Thank you for sharing the post. Thank you for sharing this! I have a child who is two and recently miscarried my second child. God has been teaching me and growing me, but it doesn’t mean it’s easy. I happened upon Good Morning Girls on Pinterest this week and was so excited to see the next study was on Job. And then to see your post… it was definitely God that directed me to this study! I know it’s okay to feel sad, but I also know I need to choose JOY each morning. I will be keeping this list so I can refer back to the verses. Thanks! I am so sorry for your loss, Nicole, I pray that Lord comfort your heart. I am so very glad you found me and the study!! Please let us know if you have any questions or need anything. May God bless you today!! So great to bookmark these and come back to again and again when I need a joy boost. Thank you for being open about your own experiences too when life was hard. These are wonderful. Thank you for sharing them. I struggle with depression a lot. It really peaked for me after I had a miscarriage as well. They are absolutely devastating. This is something I’ve just started to learn: “True joy is supernatural and comes from God.” Thanks for the reminder :). I am so glad that these promises spoke to your heart. 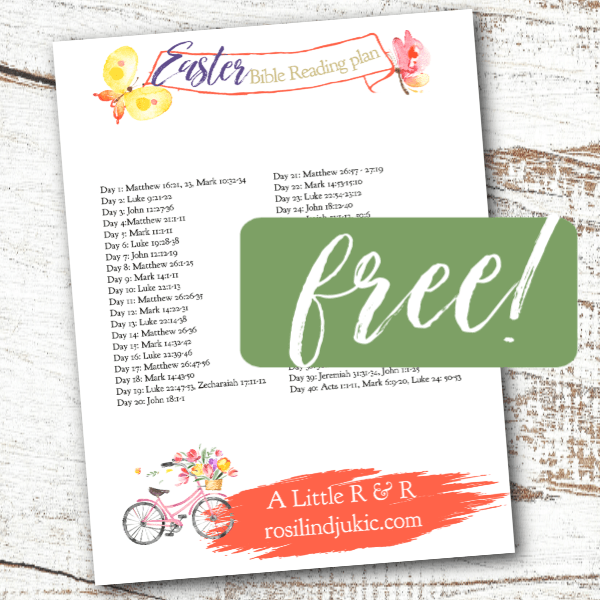 I love these reminders about joy! We are never promised that life will always be easy, but the Bible does have many good and hopeful things to say about joy. didn’t really discuss it with anyone until I finally had a best friend as a adult and it turned out she had suffered one herself. It was like finding a lifeline! Should you need or want to discuss anything under the sun, I find the sincerest relief talking to another mother with heavenly children. Feel free to contact me. It would be a pleasure. Thank you so much, Kathy. I agree, it is something that is hard to understand until you’ve experienced that level of loss. We do need to have those around us we can talk to, because the burden of pain is too great.